Yup, I did it for my kid's preschool/daycare teachers. And really, I wasn't going to post about it. They are all over blogland in various forms ranging from really cool... to really bad (c'mon... you should have just gone with the Starbucks gift card). Do you really need another crayon monogram blog post? This project is a pain in the booty. No really, it is. 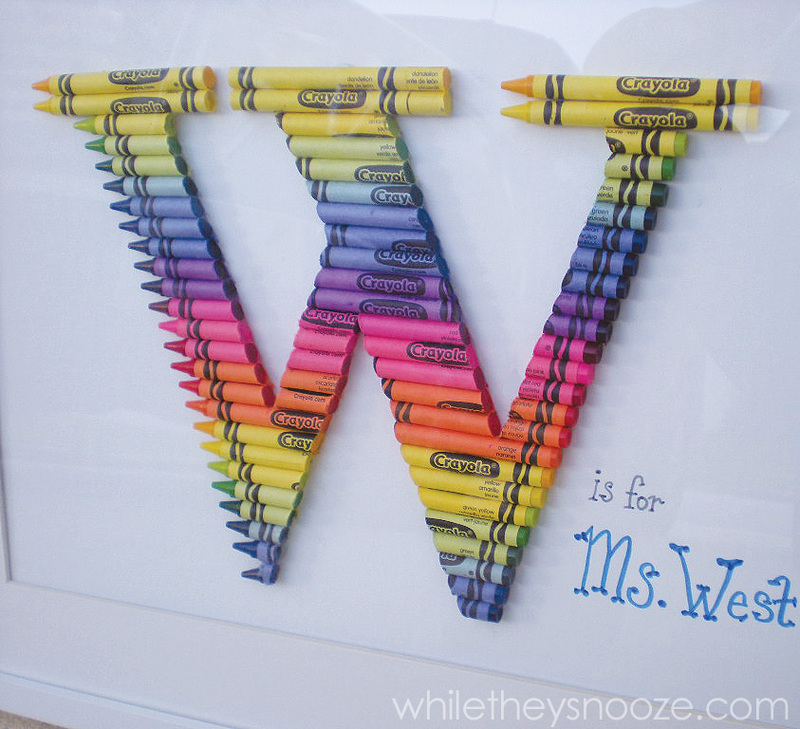 The concept is simple: Glue a bunch of crayons to some paper in the shape of a letter. The execution is the painful portion. No one tells you that. This is why I felt compelled to warn you and also why there are so many bad examples out there. I mean, let's be honest. There are several out there that I gave the stink eye to, but I'm not about to call out someone's effort in thanking a teacher. I know better. The thought really is what counts and any sort of appreciation someone wants to show a teacher is good with me. 1. Cut crayons are messy. 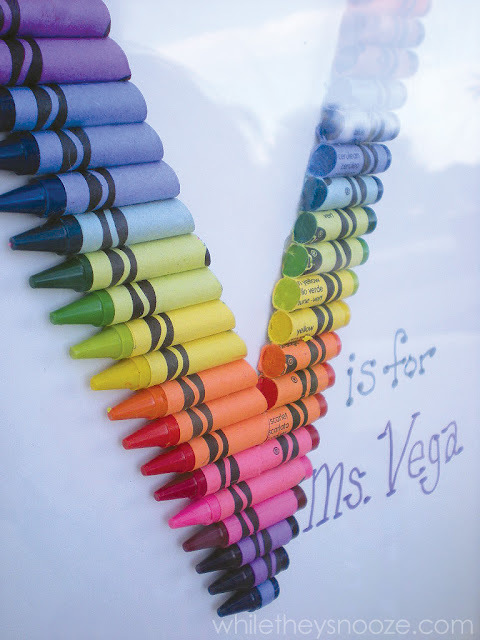 You will be cleaning up crayon shavings for weeks. They will smudge all over any surface you work on or near. They will be on your floors, on your tables, and stuck to your kid's shoes. 2. Hot glue melts crayons. Hot glue is my go-to glue for any project because it dries almost instantly. It works great on the paper part of the crayons, but melts them as you cut and the pieces get smaller. I had to switch to another glue for the small parts then find a place for this sucker to dry without my kids touching it. 4. You must work and glue on one piece of paper, then cut your letter from that paper and transfer it to another without smudging or marking on the new paper. Did that make sense? It was a bit like transferring a layer cake from your baking pan to your serving dish. I must say, the "V" was much easier than the "W". And I can imagine a "T" would be even easier. See how I had to cut the crayons at the bottom to keep a consistent look? There was a lot of complaining during this project, I'll admit. But when I gave it to Kaley's teacher and got a tearful thank you in return, it was worth it. They turned out pretty awesome. Now you know the truth. Will you still tackle it? Sarah, these are freakin awesome! Love your attention to detail :) and the Ikea frames just finish them off so nicely. Thanks Jackie! You would be really good at this. It's the attention to detail that makes it look cool. 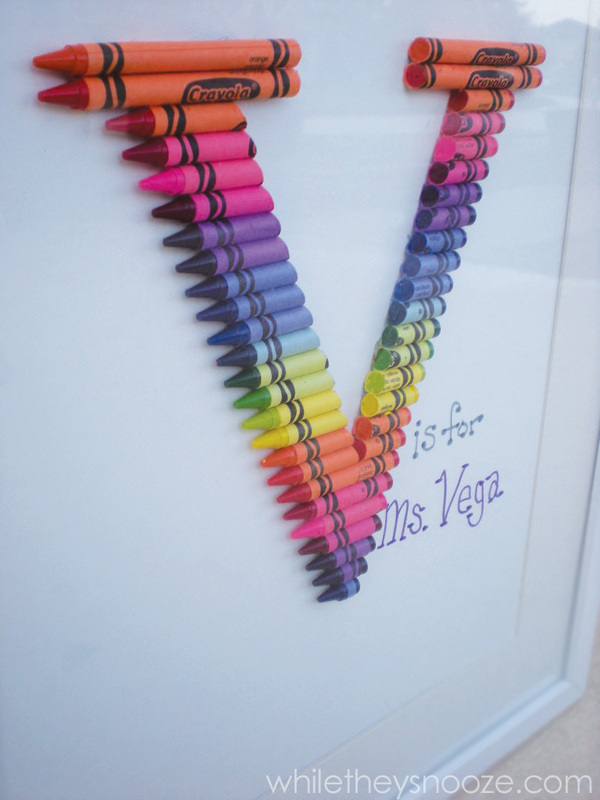 I think colored pencils would be really cool too but I guess you would need a little saw to cut them. Hmmmm. I teach and I think they are too much work :) Thanks for the honest review of the process. I could see how annoying that probably was, but they look GREAT! Cute idea, thanx for sharing! I bought a bunch of crayons and a frame to do this for Alex's room! What size frames did you use? I used the 11x14 ish ones from Ikea. It's the rectangular size larger than the 8x10. I think they are $15. Print your letter on a piece of paper in outlines, like 15% grey. Then glue to that. 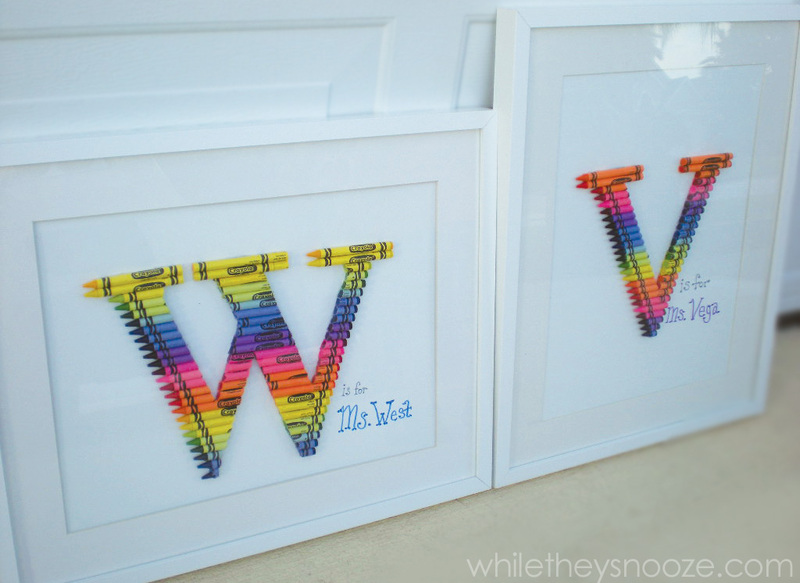 Once it's all glued down, flip it over and cut that paper away with an xacto just inside the edges of the crayons. Then glue your letter down to your final backer (I used illustrator board). Good luck! Can you tell me what you cut with? And is there a trick to the angles you used, or just that you followed the outline carefully? Hi Tracy. I used an Xacto knife or razor blade. Just push it into the crayon slow and kind of rock it back and forth a little. Once you get 1/3 of the way through, they snap usually. I just followed the outline carefully. 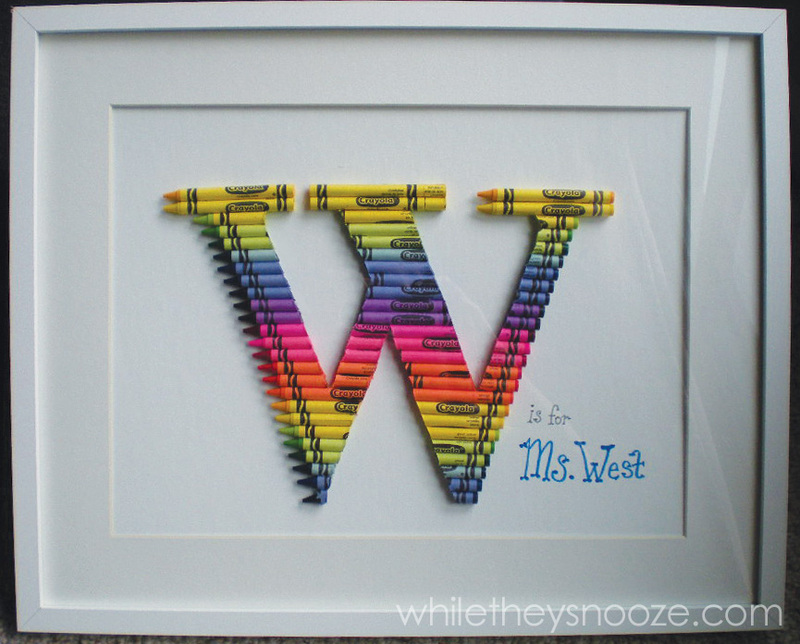 I put my crayon on my outlined letter, scored my cut while it was on the outlined letter, then cut it all the way through. Hope that helps! I am trying to make one of these ... 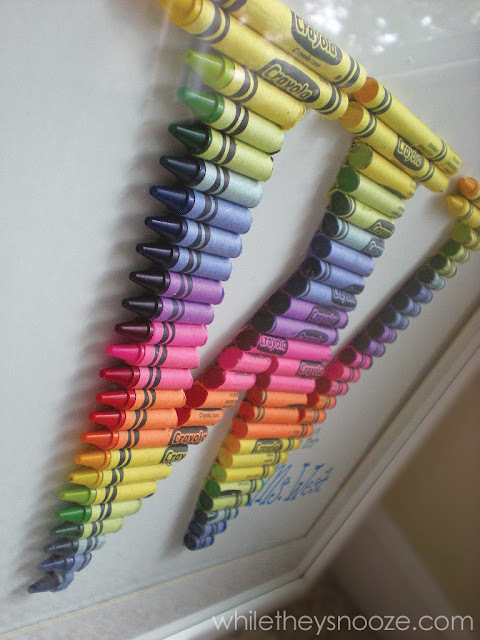 I found that if you score the crayon all the way around,it will break evenly. When you printed your letter with the 15% grey, did you use a particular font? Thanks, beautiful work! I believe this was plain old Times Bold. I tried to use something with a large serif.. I think it looks nicer when you have a serif to curve around. Hope that helps! Thank you! Me and my mom recently made two of them, since my little brother has 2 teachers in Kindergarten. She did the W and I did the B. It was our first time and I think they turned out good, we did infact see the crappy ones you mentioned via a Google search and yea....let's just say we tried our hardest not to make them look that horrible lol. But for our first try I think they look wonderful. You did a great job! Thanks for sharing them with me! Hi Sarah, can you believe I finally got around to making this? I bought those crayons during the back to school sales, haha. I'm done with my "A", but one question about the frame. I'm pretty sure I have the same one you had (Ikea RIBBA), and you said you used the illustration board as your final backer. Did you have enough clearance to close those little tabs even with the extra width of the crayons? This frame is definitely not a shadowbox frame, so I'm wondering how you made it work. Did you have to do anything special to the back to get it to stay put and also to add that hanging wire that comes with the frame? Thanks! Yes, thanks :) I'll have to try that after my Joann's trip for the board. Can't wait to see it up on the wall! I want to see it when it's up on the wall! Hi where did you get the w template? Haha! Thanks Beth! My kids have been through 5 or so more teachers since I made these... I haven't made another. To make it look nice, it takes a lot of work! And for the record... I'm a huge fan of Starbucks gift cards! I made 3 of these (letters Mx2 and P). I used my husbands scroll saw to cut my crayons and I used super glue to glue mine down to black constuction paper which I then glued to the back of my frame. They turned out perfect! My first M was not as good as my 2nd. It gets easier as you go. I did have issues with it fitting into the frame. I think next time I'll just take the glass out. Might look better? Thank you for this tutorial!! Here is a link to a picture of my finished product. 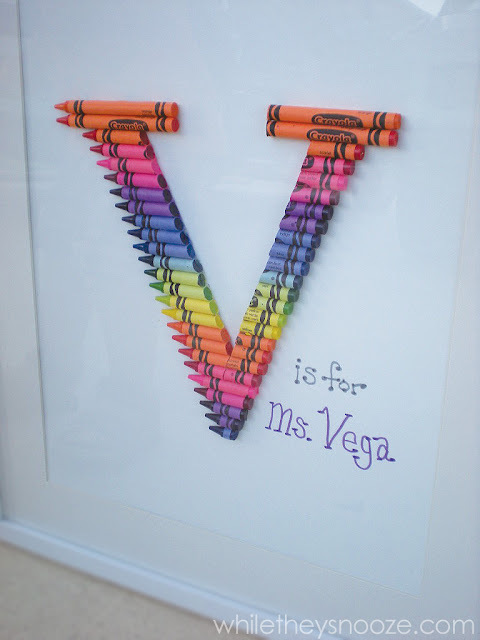 I want to do this for my son's teachers this year - yours came out so gorgeous! Are the frames regular picture grams or shadow box frames? Thanks for the tips! I just finished a 'D' for my daughter's kindergarten teacher...I found a 12x12 shadow box at Michael's and was able to sand down the ends of some wooden rulers to help frame out the letter inside the box. I mounted the D on chalkboard paper after drawing lines like the early elem. writing paper with the dashed middle line. Thanks for the inspiration, eye for detail and tips for making this something I'm actually willing to give as a gift!